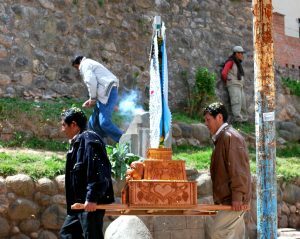 Today is a feast day with historical resonance throughout the Andes and especially in Cuzco. It is the Feast of the Cross. 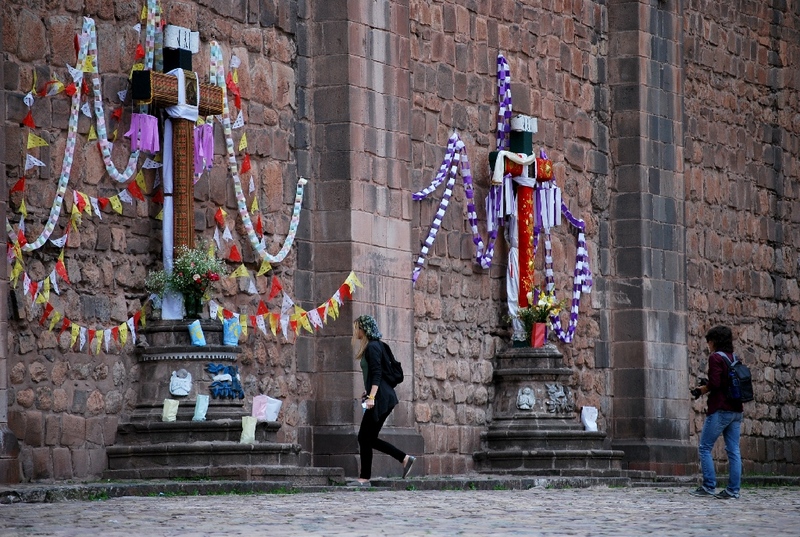 While in most of the Catholic world the cross is celebrated in September, following historic Spanish usage it falls on the third of May in the Andes, a time with deep indigenous significance far beyond that of Catholicism. 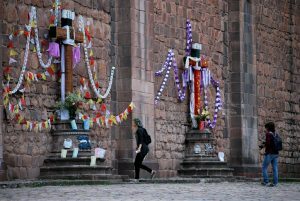 Last night in Cuzco people stayed up all night to greet their crosses, light them candles, and feast them with food, drink, and dancing. In neighborhood after neighborhood groups of brotherhoods organized around this feast gathered together to honor the local crosses. They dressed them. Where movable they took them to festive grounds, sometimes in a pilgrimage like procession. Where fixed they feast around them. 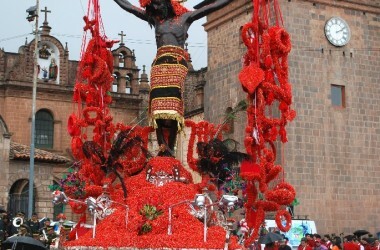 The organization of this celebration with its feast sponsors and helpers both brings the city together, more than almost anything else, in common devotion, at the same time it divides the city into neighborhoods and other devotional groups. 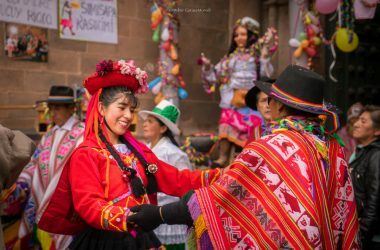 It is so ingrained in the city’s social life that Cuzco continues to have a strong local culture and society, despite the pressures of modernization and being a world center of tourism . In Catholic terms, this feast represents the finding of the true cross and has a long and complex history in the Catholic world. In the Andes, it was brought by Spanish religious orders and secular priests as part of transforming the Inca Empire, after the conquest. Original Inca feasts were increasingly suppressed through the sixteenth century and only devotion to Catholic figures was recognized and authorized. To this end crosses were placed on many of the huacas, or sacred stones and places, around Cuzco to shift devotion from indigenous deities and nature to a Christian cosmos and soteriology, or story of salvation. Nevertheless, the May 3rd date and the cross itself allowed for an amazing blending of worlds, such that in one way the crosses speak to Christianity and Church authority while also speaking to ways that have roots deep in the Andean past. May is the month of major transition, when the rains end and the dry season begins. According to Yaya it is also the time when the sun changes from the rainy season sun, often hidden behind rain clouds, to the dry season sun which shines radiant, powerful and bright. 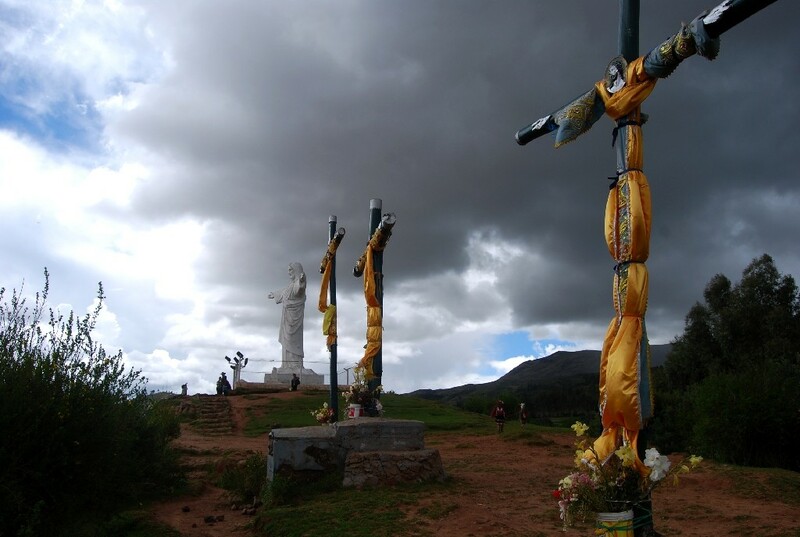 The cross itself is not a new symbol in the Andes, but seems to have Pre Columbian roots. Here it suggests both a living tree, with its movement between the world of skulls and the dead and the world of the sky where the sun and God reside. It is reminiscent of the chacana in its ability to also signal levels and the joining of the vertical and horizontal dimensions of life, the male and female together, as well as the broken landscape of the mountains with various floors, flat lands, and slopes. 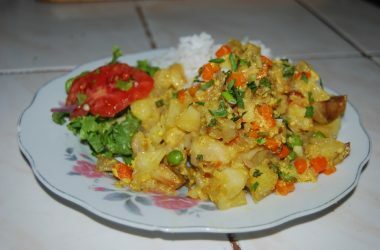 This feast, as the dry season sun arises strong and bright, is when the earth dries out and goes to sleep for a while. She opens as they say and allows her tubers to be harvested while she recharges for another year. Her reawakening will take place after August, the month in which practically everyone makes an offering to the earth mother. At that time the bright sun starts to transition to the sun of the times of rain. Whether read as Catholic or Indigenous, the Feast of the Cross is a powerful event. 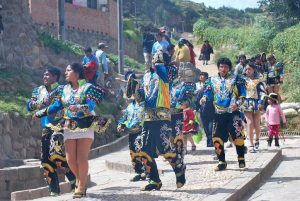 It brings the cosmos, local land and international theologies, to ground in the lives and social groups, as well as landscape, of Cuzco and its people. The big event in Cuzco was last night, called Cruz Velakuy, or sitting with the cross while lighting candles and feasting. Today people are tired and rest. Anyway, now the new sun shines bright in the sky. The Christian calendar moves towards Corpus Christi. the Body of Christ, and the tourist season with its possibility of making money begins anew. Cuzco and its people are refreshed and ready to receive hordes of outsiders while staying true to self.